If you produce high value content that you want to drive sales, a great way to do this is by turning it into gated content. This is the practise of only granting access to content if a user submits their contact information. You can then use these contact details to boost conversion rates through direct content marketing. The most popular one that you've no doubt seen on dozens of websites is through a contact or signup form. You'll see something like 'Grab our free marketing ebook when you sign up'. This typically enables users to download a PDF after submitting a form. A common place to find these is in the sidebar or footer, where they're very visible but not as disruptive as a popup. Read our recent post on how to include a contact form in your sidebar if you want to boost conversions. Information exchange is a win-win scenario. You get valuable email addresses to grow your list and your target customers get value for free. If you're finding it difficult to encourage people to sign up to your email list, gated content could very well be the way forward for your email marketing strategy. It helps you stand out and also provide value to your potential customers, even before they've bought anything from you. What's not to love about it? Just think of the contacts and conversions you could be missing out on by not using this marketing strategy! If you're now wondering whether offering file downloads on your WordPress website is difficult, don't worry it's not. 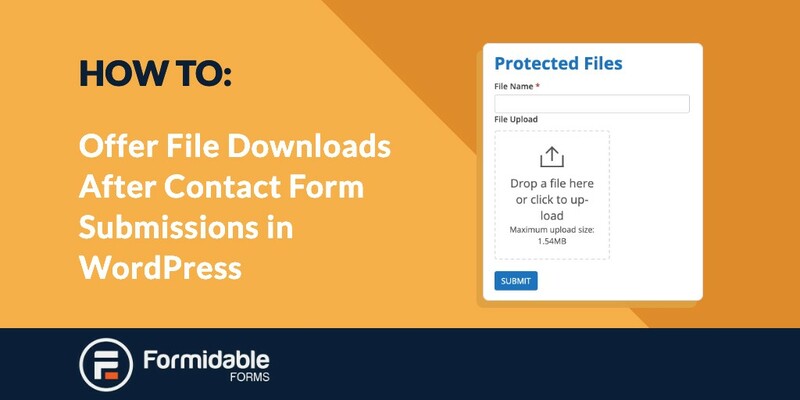 In today's post we’ll be showing you just how to offer a protected file download when users submit a contact form or signup form. The very first step in creating a form that supports file downloads is to create a brand new form. As you'll be using this for protected files (gated content), call this form 'Protected Files' to make it easier. Now you'll need to populate your form with some fields. First add a Text field, this will be a single line field and for this we should call it 'File Name'. Once that's added and renamed, expand the options of the field and make sure you check the boxes 'Required' and 'Unique'. You can see what it looks like in the image below. Now it's time to save the form, so click ‘Create’. When the new form settings load, you should find a list of check boxes once you scroll down. Check the box that says ‘Protect all files uploaded in this form’. To save this change, simply click ‘Update’. In order to allow people signing up to see these files, you'll need to display them. You can do this by creating a new View. This is just like when you create a brand new form, except you click on View instead of Forms. Call your new View ‘Display Protected File’. In the View Format, select Single Entry. Now's the time for some simple code. Just make sure you replace [x] with the Field ID of your file upload field and [y] with the Field ID of the File Name in order for it to work. Once you've done that, scroll down and find an option for 'Filter Entries' in the Advanced Settings section. Save your changes before moving onto the next step. 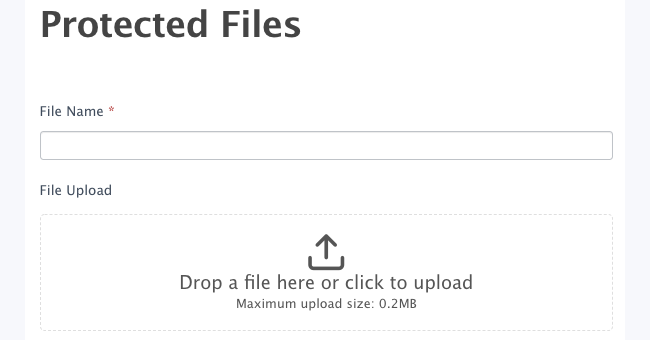 Step 3 – Display the download file after submission. When your users have submitted a form, the next step is to show them the file they can download. This puts all the steps above into action. To do this, go to your existing form or create a new one. Then go to Form Settings. Simply set the form to 'Show a Message' on submit. This will be a success message, telling the user they've successfully signed up. In this message is where you'll display the View where users will be able to download the file. In this code, the 123 stands for the ID of your View and the Test File means the File Name when you submitted the form originally. The final step is to update your form, save all your changes and then publish. Now you should have a fully functioning form that gives new subscribers or contacts access to files you want them to have. Let us know how you get on with your file download form! If you're not already using Formidable Forms, we have plenty of great features to help your websites boost conversions. We offer simple solutions to complex problems.